Ask fellow campers about "Holiday Springs RV Resort" and nearby attractions. The sites are so close together, you can almost reach out and touch your neighbor. The highway noise is loud all through the night. The pool is pretty, but I wouldn't swim in it. It has to have snakes in it. As it has the Weeki Wachee river running into it. We camped at Holiday Springs RV Resort in a Fifth Wheel. Stayed at Holiday Springs for a month. Rate of $24 per day was our monthly rate including metered electric (and we used a lot of electricity running the AC 24/7). The pull-thrus are convenient and were far enough away from Hwy 19 that noise wasn't a problem. Pull-thru site 123 was too narrow to use our awning because of the neighboring park model's orange trees but it was shady most of the day so wasn't a problem. The park has a lovely small lake with a trail around it and through the woods to the swimming area as well as a small dock with a swing. (No fishing or swimming allowed.) This creates a much nicer atmosphere than the usual park model/RV mix. There are lots of activities for residents which RVers are welcome to attend. When the wifi was working it was very good, but there were a lot or problems with it during half our stay which the very nice manager was working to resolve. We would love to return for the whole winter. We camped at Holiday Springs RV Resort in a Fifth Wheel. If you're interested in orchids, go to Everlast Inc. on Hwy 41, 2 miles south of County Line Road. It's an orchid wholesaler which also sells retail with lots of phalaenopsis and cattleyas available for $5 to $10. I was miserable here. I suppose it's personal preference, but I honestly don't know how people live here year round, as this is a trailer park/RV park combo. Crowded, Motorcycles everywhere, Noise from street, Not a moments peace & quiet! Also ...floods. We camped at Holiday Springs RV Resort in a Motorhome. Clean, cozy, friendly Park. Beautiful landscaping in a natural setting. Paved roads and RV pads. No gravel crunching here. Managers know exactly what's going on without being intrusive. Close to shopping, dining, and affordable golf. Stayed for 3 days last year, one month this year, and hope to be back for 3 months next year. We camped at Holiday Springs RV Resort in a Travel Trailer. The park seemed to be an ideal location being located on the nature coast and away from the crazy world just south. First night the traffic noise from hwy 19 was terrible, constant motorcycles. Second day a typical florida downpour and the pull-thrus were flooded. Second night, more motorcycles (bar closing time). WiFi was slow, when it was working and I was told it was a new system. Management, to say the least, did not like complaints. Third day unhooked(getting wet from the flooding). Never again will I be back!! We camped at Holiday Springs RV Resort in a Fifth Wheel. I wrote the last review (4/2013) listed below this one. Really nothing much has changed with the park. The Wi-Fi has been upgraded to Tango Net, but no charge for it, and it does work very well. It stormed while we were here and lightening stuck the water supply pump. Everyone lost water for over night, but it was repaired prior to noon the next day. They said it really fried all the wiring. The park is close to Weeki Wachee Springs and to Tarpon Springs Sponge Docks. While they list 300 sites, most of them are permanents. They do have a few pull-thru sites and some back-in sites available. The back-in sites, we were told, have cable TV hookup. This time we were on site #117. Be prepared as you will need a long electric cord and long hose for water if on this site. Overall this is a nice park and we will probably be back here again next year. We camped at Holiday Springs RV Resort in a Motorhome. Over all we found this to be a nice park. Check in went smoothly and easily. The hosts were quite friendly and knowledgeable of the area suggesting things to do and restaurants. We found the park to be very clean and well maintained. Mostly permanents that were closed up for the summer as the owners have already gone back north. The site we were on (120) was a bit narrow, but very level asphalt with a small concrete patio and picnic table. There was good distance between us and our neighbors. Water and electric was adequate, and the connections are located between sites. So my water and electric hook up was on the passenger side of our motor home. The sewer connections are on the driver's side for all the sites. We would return here again. We camped at Holiday Springs RV Resort in a Motorhome. Park needs some up dating and allot of lawn cutting. Park employees very nice. We camped at Holiday Springs RV Resort in a Fifth Wheel. The Internet connection was the best of all parks we've stayed in. The manager said they just tripled capacity! We loved how close it was to the coast and we took our Miata down there almost every day. The pool was nice and big and the community events were a blast. 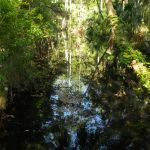 One note on the pool: it is a natural spring pool like weeki watchee springs, so not a chlorine and concrete one. Perfect for nature lovers like my partner and I! They offer permanent homes here and we're thinking of settling down here. Pet friendly was a big plus!! We camped at Holiday Springs RV Resort in a Motorhome. We stayed 2 weeks at this park, actually we paid for the 2 weeks before we realized what we had to put up with. It wasn't all bad if you were a night or two stay. They didn't tell you the showers were locked and you had to put down a $5. deposit for a key and turn in upon exit. The pool they advertise spring feed has a dirt bottom, with fish. They will cater to the over nighties more than they will for the permanent residents. Permanent residents have to go to the laundry room to pick up wifi. No washers or dryers are allowed for permanent residents. These people need to rethink there PR. There are only about 6 pull through for over nighties as it is. Will not stay there again. We camped at Holiday Springs RV Resort in a Fifth Wheel. This is a neat and clean park, but site #123, while a pull-thru, is tiny! There is nothing really wrong with the park otherwise, except that it is more a trailer park than an RV park. There is no cable. The Wi-Fi is not very good, either, and Verizon cell phone service is intermittent. We would not stay here again. We camped at Holiday Springs RV Resort in a Motorhome. My wife and I stayed at Holiday Springs for a month and had a wonderful time! The spring-fed pool was amazing and a joy to swim in even when the weather was in the 40s and 50s. We loved the park so much we are planning to buy a home in 2011 to be closer to relatives in Tampa. We camped at Holiday Springs RV Resort in a Fifth Wheel. We have camped here for a week for the last four years. It is a clean and friendly campground. The campground is mostly extended stay but it does have a number of transcient sites. We always enjoy the friendly atmosphere and wonderful natural spring pool. I highly recommend this campground. We camped at Holiday Springs RV Resort in a Motorhome. This is more of a seasonal resort, with many park models. Managers and residents are very friendly. 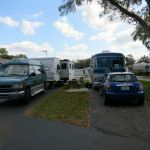 It also has about 20 or 30 short term RV sites available. Very clean and well maintained. The pool is particularly unique as it is a natural spring with a cement patio built around the perimiter. There is a nature trail along the river to a small lake with a wood deck one can relax on. Cable TV and cable internet service are available by contacting the local cable company. We spent the winter here at a much reduced monthly rate of $495, and will stay here again in the future. We camped at Holiday Springs RV Resort in a Travel Trailer. 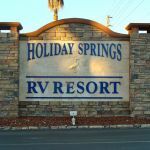 Are you affiliated with Holiday Springs RV Resort ?